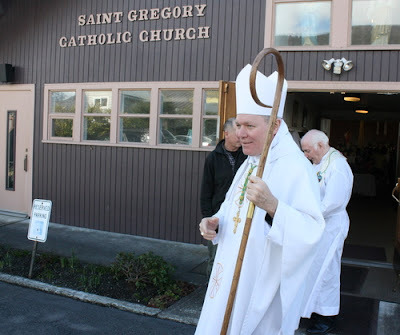 Filling the last of three openings atop US dioceses of a million or more – and two within four days – at Roman Noon this Tuesday, the Pope named Bishop Edward Burns, the 59 year-old head of Alaska's Juneau church since 2008, to lead the 1.3 million-member diocese of Dallas in succession to Cardinal Kevin Farrell, who Francis tapped as founding prefect of the new Roman Dicastery for Laity, Family and Life in August. Burns' installation as Big D's eighth bishop is scheduled for Thursday, February 9th, in the Catedral Santuario de Guadalupe. For the figure who's invariably the happiest, most contagiously-beaming member of the Stateside bench (with perpetually off-the-chart levels of enthusiasm, to boot), the move brings a daunting shift of scale that is hard to recall in any instance: going from a 10,000-member Alaska fold to what's now become one of the US church's ten largest outposts. But given Burns' premium on an intimate, hyper-relational style of ministry in Juneau – where, every Monday morning, the bishop and his 12-man presbyterate log into Skype to share Morning Prayer and a group chat – the message here is Rome's hope for that kind of engagement to be translated on the massive stage of what's now the nation's fourth-largest metropolitan area, its lead local church now almost seven times its 1990 size and in need of an ongoing institutional build-out to manage the growth. A son of Pittsburgh – where he served as vocation director and clergy-personnel chief under now-Cardinal Donald Wuerl – the Dallas pick first carved a wider profile at the USCCB, overseeing the national church's recruitment efforts as priest-director of the conference's vocations secretariat. Amid his new charge's years-long push to increase its number of seminarians – not to mention Dallas being home to Texas' growing college-level formation house, Holy Trinity in Irving – that priority is highlighted by the Pope's choice, as is Burns' even broader strong suit of ministry to young people given above all the presence of the University of Dallas, which is affiliated with the diocese. All in all, when it comes to energizing people in general, simply put, among this bench nobody does it better. That said, however, if there's one area where Burns' skill-set hasn't yet been tested in depth, it's in ministry to Hispanics, who comprise roughly half the Dallas fold. With the Big D pick, a long year of uncertainty ends – according to credible tracking reports, Burns' name came up in the process for practically every major US appointment on deck, from the Twin Cities and Newark to Anchorage and Arlington, and was seen in early buzz as figuring big again for the vacant archdiocese of Indianapolis. It is curious, however, that the one option that was never raised was the one to which he's now been sent... but as Dallas is far closer than the others to his Mom in Arizona – and arguably the plum opening of the current Stateside docket – nobody's complaining. In any case, upon settling in to his new life of I-30 and 35 traffic and apocalyptic summer heat, one of the key calls awaiting Burns will be his recommendations for a second auxiliary to replace Bishop Doug Deshotel, who was named head of Louisiana's Lafayette diocese (his birthplace) early this year. Considering the new North Texan's black-and-gold roots, however, the more pressing question on Day One lies instead with another choice of team – namely, is he a Cowboys fan now? 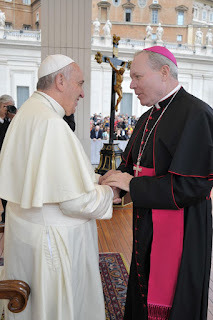 In any case, it is a remarkable confluence that the chief shepherds of Texas' two largest cities are now both natives of Pittsburgh – the other, of course, being Houston's Cardinal Daniel DiNardo, now the USCCB President. A 2pm presser is scheduled to introduce the eighth bishop to his new charge. With today's move, seven Stateside Latin sees remain vacant, with another four led by (arch)bishops serving past the retirement age of 75.